Visa has said it is considering offering incentives to UK businesses to go cashless, after introducing a similar scheme in the US. 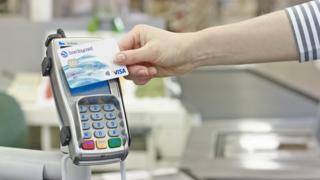 The payments company is selecting 50 small companies in the US to receive $10,000 if they only use cards. The companies have to bid for the money by explaining how going cashless would affect them, their staff and customers. However, the idea has been criticised by consumer groups, who say cash is still vital for many people. "It is easy to categorise it as a bribe, but ultimately they are incentivising companies to do away with cash, and that's not the job of people like Visa," said James Daley of consumer group Fairer Finance. In any case, the offer could be of limited appeal to many retailers, who have to pay fees every time a customer uses a debit or credit card. Even though interchange fees, as they are called, have been capped by the EU, retailers still pay an average of 16p on each credit card transaction, and 5.5p on each debit card. In total UK retailers still paid £800m in such fees last year, charges that have been criticised by the British Retail Consortium (BRC). Cards have already overtaken cash for retail payments, according to figures for last year from the BRC. But banks and card companies should not be driving that move, Mr Daley said. "In 50 years it seems unlikely that most of us will be using cash. But banks need to let evolution follow its natural course, rather than accelerating it," he told the BBC. "As a responsible society we need to look after vulnerable customers who rely on cash." Last month Victoria Cleland, the Bank of England's chief cashier, said that 2.7 million people in the UK rely almost entirely on cash - that's 5% of adults. Nevertheless at least one cafe in London - Browns of Brockley -has already gone cashless. In a statement, Visa said that following the launch of the scheme in the US, "we hope to bring similar cashless initiatives to other countries, including the UK". "At this time, we do not have a firm plan on when such an initiative would be available in the UK." In June this year, Visa chief executive Al Kelly told investors that the company was "focused on putting cash out of business". "The number one growth lever [for the company] is the conversion of cheque and cash to digital and electronic payments." Taylor Review: No cash, no problem?